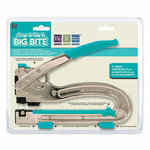 The Crop-A-Dile Big Bite boasts a six inch punching and setting depth so you can place eyelets, snaps, gromlets, and other metal embellishments anywhere on your scrapbook page or craft project. It punches holes and sets small (1/8″), large (3/16″) and extra large eyelets and snaps. The Big Bite can punch through paper, leather, fabric, plastic (such as CD’s), thin tin, and chipboard. This is a tool that I use on about 25% of my scrapbook pages.